When I made these vegetable cutlets last week, I made a big batch of the potato mixture to last me a while. These cutlets make a tasty patty for a burger. So that’s just what I did – made some burgers. And what good are burgers with no fries along side? Not the greasy kind, but the oven-baked ‘healthy’ kind. Lighlty toast the burger buns. Spread mayo on the buns. 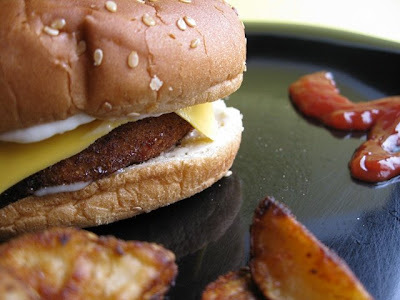 Place a vegetable cutlet on the bottom half of the bun. Top with a slice of cheese and onion slices. Place top half of bun and dig in! You can add your own toppings to jazz it up. Scrub the potatoes using a small vegetable brush to rid the potatoes of dirt. Rinse thoroughly and pat dry with paper towels. If you don't want to leave the skins on, then skip the scrubbing step.Half the potatoes and then cut into 1/3 of an inch wedges. Transfer to a bowl. Add olive oil and the remaining ingredients, toss to coat potatoes. Spread out evenly onto a baking sheet lined with foil. Bake for 20-25 minutes until crisp and golden brown. Flip wedges once halfway through cooking time. the fries look yummy and different from the usual colour we see! Wow the burger looks so yumm and the fries, they are just so so delicious. love the fries!!! soo different fromt he regular one! 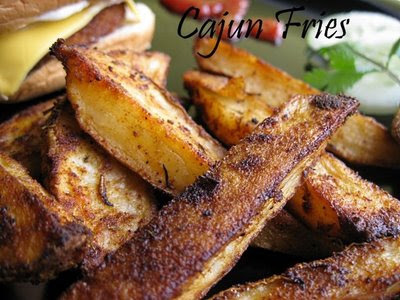 I loved the cajun-ness of the fries. Lovely. Oh my gosh, what a splendid looking platter. Love those arrangement, potatoes looks crispy and nice. Those fries look like something i could get hooked to.. I've not added coriander powder before - yummy. Lovely burger and lovely fries! burger & fries looks mouthwatering .. These look yummy and the fries looks absolutely amazing! oh my god.... these burger and fries look to die for! great one. thanks for visiting my blog namratha.. u have a nice space here.